It is Labor Day 2016: Remain alert, Hermine, Lester and Newton are out there! Florida got hit by a land-falling hurricane, after eleven years of dodging impacts from tropical cyclones, when HERMINE came on shore in Apalachee Bay the early morning of 2 September. This was quite a feat indeed, when you consider there were 145 tropical cyclones generated in the north Atlantic basin during the 2006 – 2010 period, and that HERMINE was the 8th named storm of the 2016 Atlantic hurricane season. So what is happening today, Monday 5 September LABOR DAY 2016? For starters, extra-tropical cyclone HERMINE, which only yesterday had traveled some 800 kilometers away from the U.S.A. coast, has now drifted back toward the northwest and it is affecting a large region from the northern Jersey Shore and Long Island to Cape Cod, Boston and points beyond, with rain, wind and surge. Looking south and then east from HERMINE’s current location we have a tropical wave in the eastern Caribbean that is generating widespread rain over the region, but other than this it is not showing any cyclonic tendencies, for now at least. 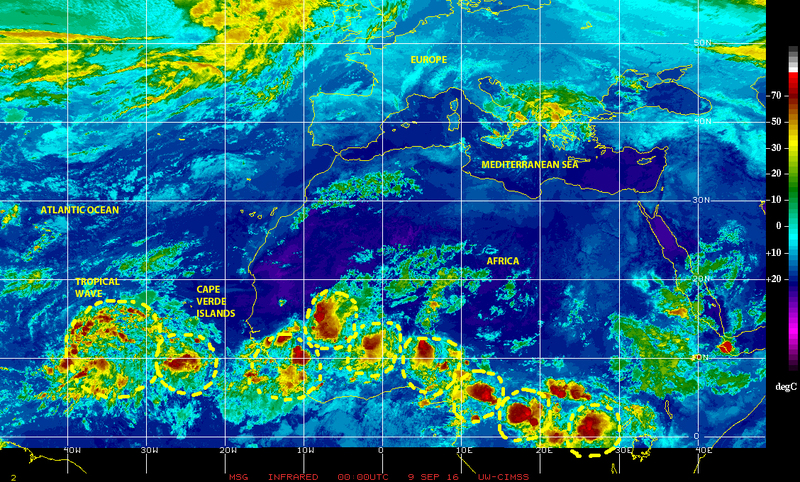 Looking east we see ‘Hurricane Alley’ populated by a chain of disturbed/stormy weather cell, and several large tropical waves over the eastern Atlantic waters and the entire length of Equatorial Africa. 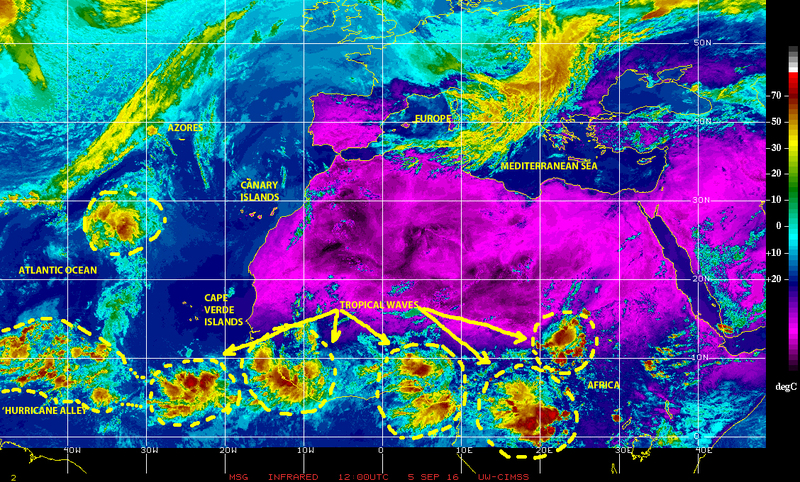 There is certainly plenty of fuel for potential cyclonic development form anyone of these ‘seeds’ in coming days. 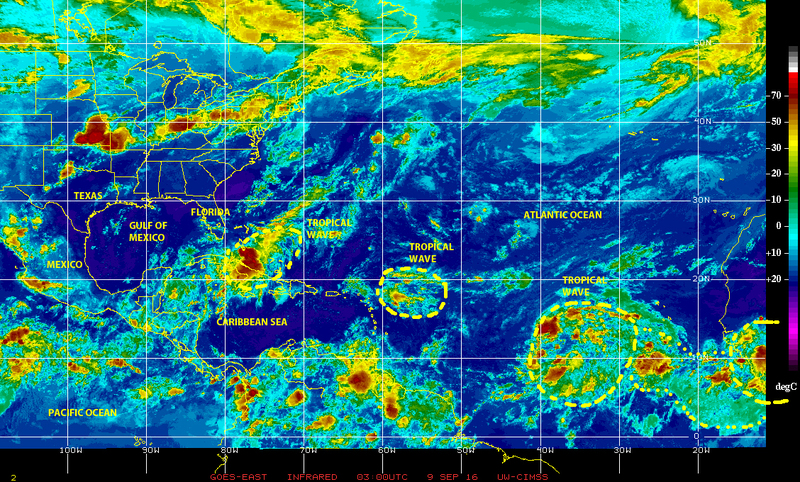 The prudent attitude for all interests throughout the Atlantic basin is to remain alert, be prepared and closely monitor the progress and/or development of these disturbances for any signs of potential cyclogenesis! 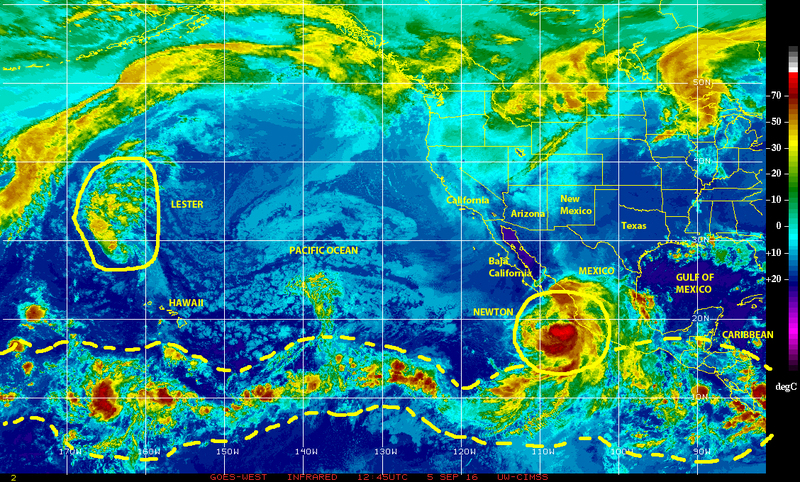 Over on the northern east-Pacific side, there is Tropical Storm NEWTON just off (150 kilometers) the Pacific coast of Mexico to the west of Puerto Vallarta, moving NNW toward the Baja California peninsula. Farther to the northwest of NEWTON’s current position there is a decaying tropical storm LESTER, which veered away from Hawaii literally at the last minute, a couple of days ago. 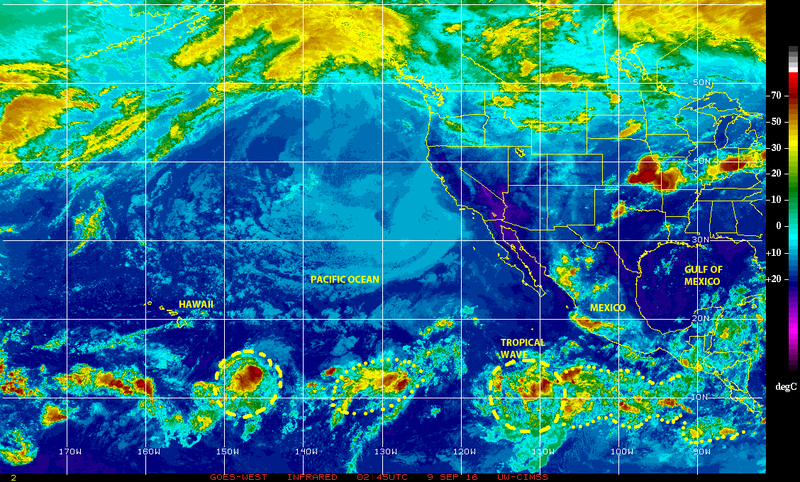 To the south and southeast the eastern-east Pacific sub-basin between southern Mexico and Panama is populated by several tropical waves and disturbed weather cells, which may contribute to cyclonic development in coming days. NEWTON is the 14th named tropical cyclone of the 2016 East Pacific hurricane season so far. The basin has generated 194 tropical cyclones since 2006, and may generate a few more before this annual season is over. 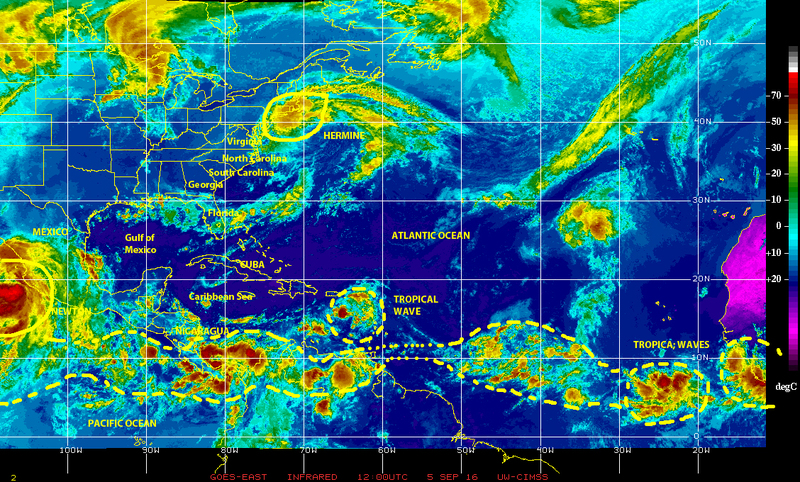 In assessing recent cyclogenesis (i.e. : GASTON and HERMINE in the Atlantic, and LESTER, MADELINE, and now NEWTON in the eastern Pacific) the footprint of global warming and sea level rise are unmistakably clear in the wetness and strong surge/wave impacts of these tropical cyclones, which generated unprecedented amounts of rain, coastal erosion and flooding along their paths. While we anticipate future impacts from the Atlantic and the Pacific for the duration of the 2016 season, we will do well to examine what we have done OR NOT regarding hazard mitigation measures, and adaptation measures, to reduce the potential for damage to our built environment and the life, property and full range of human activity sheltered within? What specific defenses have been implemented along coastal regions? How have design professionals and policy-makers enhanced/strengthened building codes and design criteria to make our communities resilient, in the face of expected impacts? The time for ACTION on all these fronts has been here for quite a while, the time for TALK and BUSINESS-AS-USUAL in long past!